"Adorable!!! I know you have magic mom powers, but how did you get them to stand??" Winter Olympics fan Meagan Shemenski of Kern County, California, is showing her American spirit on Instagram with the help of her identical twin babies and a photographer friend. 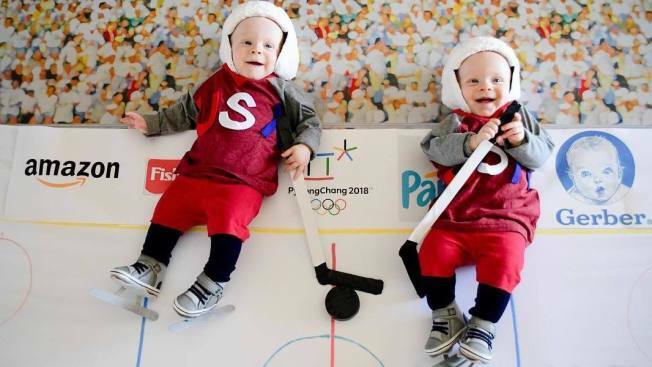 The mother of four posted a photo during the opening ceremony of her sons, Zachary and Benjamin, dressed up in outfits to celebrate the 2018 Winter Olympics. Photographer Genevieve Collins helped conceptualize the props and scenes. The babies regularly don the American flag and pose on paper backgrounds that creatively represent various competition venues. The friends plan to continue posting the photos through the closing ceremony. "It took weeks of planning, prop and costuming making, and photography days to make it happen but we are excited to share one pic every day of the Olympics," Shemenski wrote on Instagram. The blue-eyed babies are dressed like American Olympic heros -- flag bearer Erin Hamlin, speedskaters Maame Biney and Erin Jackson, and snowboarders Red Gerard and Jamie Anderson. Shemenski started off the series of images with a photo of the 7-month-old boys as torch bearers during the opening ceremony. The image that's garnered the most engagement is of the boys wearing goggles and standing on snowboards made of cardboard. "Adorable!!! I know you have magic mom.powers,but how did you get them to stand??" one commenter wrote. Others have tried guessing which twin is which in the photos. Collins shared to help followers tell them apart, she often has the boys hold different props -- Zachary in red and Benjamin in blue. "We had a lot of fun coming up with the idea and props for these photos and are so happy with how they all turned out," Collins said.